Going Nutty! : A Tuesday Giveaway!!! Anyway- you know it's Tuesday here because one out of three Littles will come home and tell me that it is Taco Tuesday Fundraising night for our cluster of schools at the taco joint down the road. We also know it's Tuesday because I will tell that Little "No." It is Taco Tuesday for all 3 schools and they have 4 parking spaces in front of the building. You can also tell it's Tuesday because two out of three Littles will get off the bus with two things in mind. 1.) I have to get a snack before I die. 2.) I have to remind Littlest Little that it's Towel Tuesday! I swear, if they worried more about what they were responsible for instead of what the others were.....you know where that's going, right? Littlest Little has limited chores. Cause he's little. (Duh?) He's getting bigger though- so along with trash, we gave him another chore which is to wash, dry, fold, and put away the towels in their bathroom- on Tuesdays. "Don't forget the towels! It's Tuesday! Did you get the towels out of the dryer? Remember to fold them in thirds"
You also know it's Tuesday around here cause We The People get the TV back tonight!!! There is nothing but football on the tube Sat- Mon!!! Ugh. It is a small celebration when you realize that you get to use the remote!! Watching football over the weekend though DID give me the opportunity to play around with some yarn ! At the urging of Mrs. Wheeler- I started making pumpkins. And they turned out pretty cute! 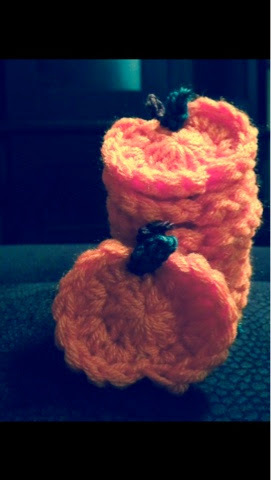 While I listened to him go on and on about this player and that coach, I just crocheted away. I added them to my Etsy, too this weekend. And then turned my kitchen table into mailing station!! Even though Halloween is only a couple weeks away, it will be Fall for a while still! I plan on adding several more styles and colors....maybe even some turkeys and trees! You can follow my Etsy to see when they are added. 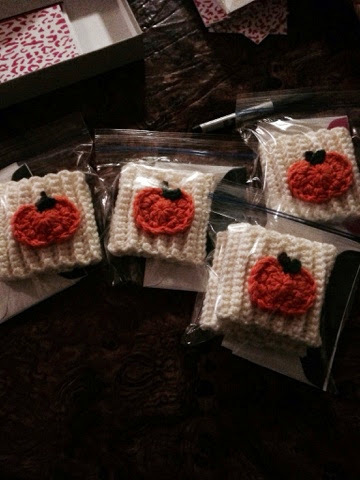 To share all this pumpkin cuteness a little quicker- I'm going to send one to one of my Etsy followers, one to a FB fan page for my Etsy shop, and one to a Pinner! Check out the Rafflecopter below to see how you can enter! I'll announce the winners as soon as the contest ends! So now this hasn't turned out to be such a bad thing that he had the remote all weekend!! I can't wait to come back and announce the winners! 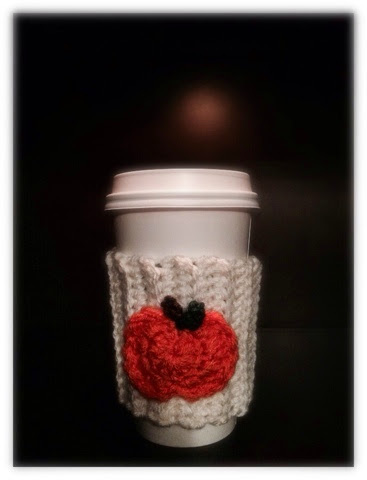 I love your coffee cozies! I have a mustache one already! This would be such a cute addition! Hope you're enjoying your shoes! SO as soon as I figure out how to use Pinterest again I will share your fabulous items. Hubby worries when I watch Snapped - he points out that they always get caught - lol. Love your posts.